I’ve spent another week of evenings painting skirting boards, but now they are all on the wall and there’s just a bit of residual gap-filling to do. 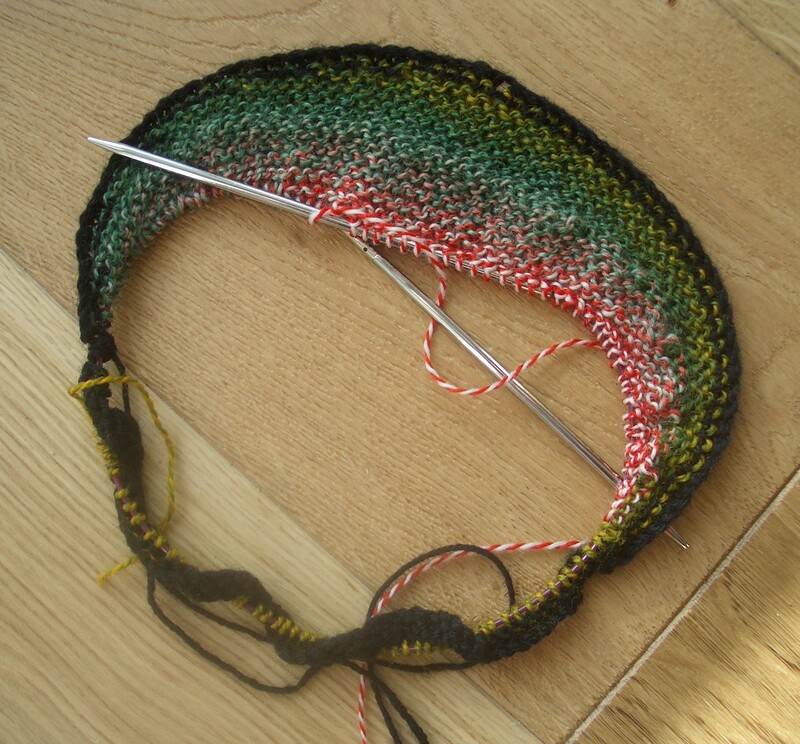 I have time for knitting again, which means I’ve finished one project and started the next. 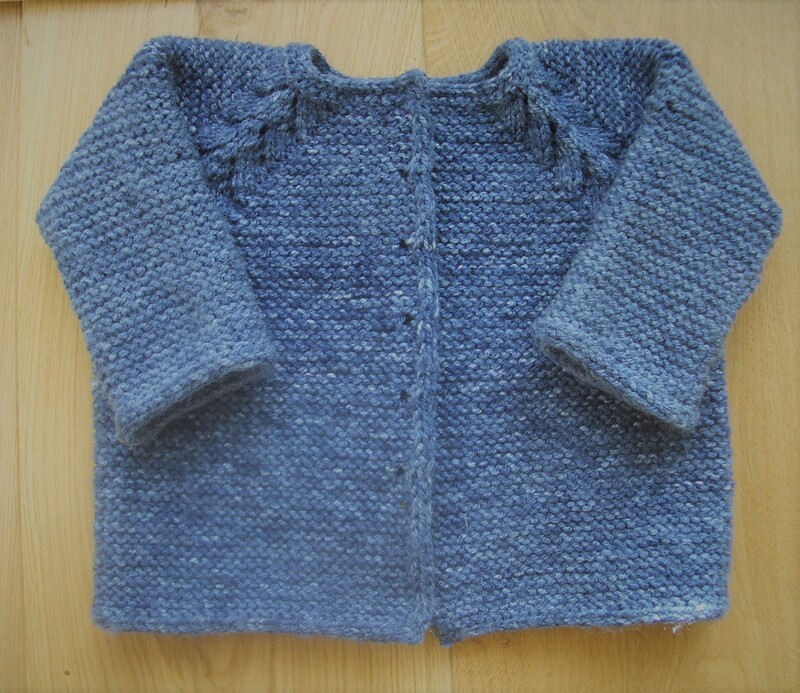 First the FO (finished object), the Norwegian Fir baby cardigan. I haven’t bought the buttons for it yet, I’m thinking maybe little yellow ducks rather than blue buttons. Or perhaps plain round buttons, but each in a different colour? I’ll have to see what inspires me the next time I get to a haberdashery shop. There’s no hurry, this cardi will be a Christmas present. I might even try making a matching hat before then, using the fir-like lace pattern that formed the raglans. Now for the new knitting project, Dreambird. I’ve had this pattern, and the yarn for it, for quite a while but was put off casting on by its apparent complexity and the many adverse comments on Ravelry about the clarity of the instructions. Dreambird has to be one of the most stunning designs ever to appear on that site, a dramatic shawl featuring feathers created with short rows. However, it’s also a pattern that has attracted a lot more criticism than most, with many a would-be Dreambird knitter falling by the wayside on their journey to own such a show-stopper of a shawl. The designer has attempted to explain the design concept, which is a commendable aim, but it seems that something has been lost in translation (literally as well as metaphorically) and the lengthy explanations have only contributed to the confusion. What the pattern lacks is a succinct, well written, idiot-proof set of row by row instructions. There is one page that comes close and, following the advice of myriad successful Dreambird knitters, I am focusing on that page and adding my own notes to it. I’ve knitted quite a few short-row designs before, mostly using the technique known by Anglophones as German short rows (GSRs) which produces a “double stitch” at the turning point, and I’m hoping that this experience will give me a head start. Well, I cast on last night and have more or less completed the first feather, but I have yet to knit the first background section that sits between feathers. My background is plain black, the better to show off the Crazy Zauberball feathers in colourway Papagei (parrot). Rather than counting lots of stitches, I’ve annotated the instructions to put them in the form I’m more used to when working GSRs, namely “knit up to and including the double stitch, and then X more sts” or “knit until there are Y sts before the double st remaining on the left needle”. X and Y are nice small numbers, which reduces the counting considerably and makes it possible to hold a conversation or watch TV while knitting. Also, being a nerdy sort of knitter, I charted out the instructions in Excel before I started, much as I did when experimenting with swing knitting. I wanted to see how the short-row shaping worked, and how the feathers mesh into the background. Is this all going to help, or will I be one of the many who have started a Dreambird and been unable to make it work? Dreambird or Nightmarebird – only time will tell. This entry was posted in DIY, knitting and tagged Dreambird, German short rows, Norwegian Fir. Bookmark the permalink. 2 Responses to Dream or nightmare? That pattern is in my queue also, but I still haven’t found a color combo to knit it with! So you are much further along than I might ever be. LOL! I will watching your progress, not at all worried you will fall by the way. There are several lovely Dreambirds on Ravelry knitted with Schoppel Zauberball or Crazy Zauberball, so it wasn’t a difficult decision to choose that yarn. Thank you for having confidence in me!